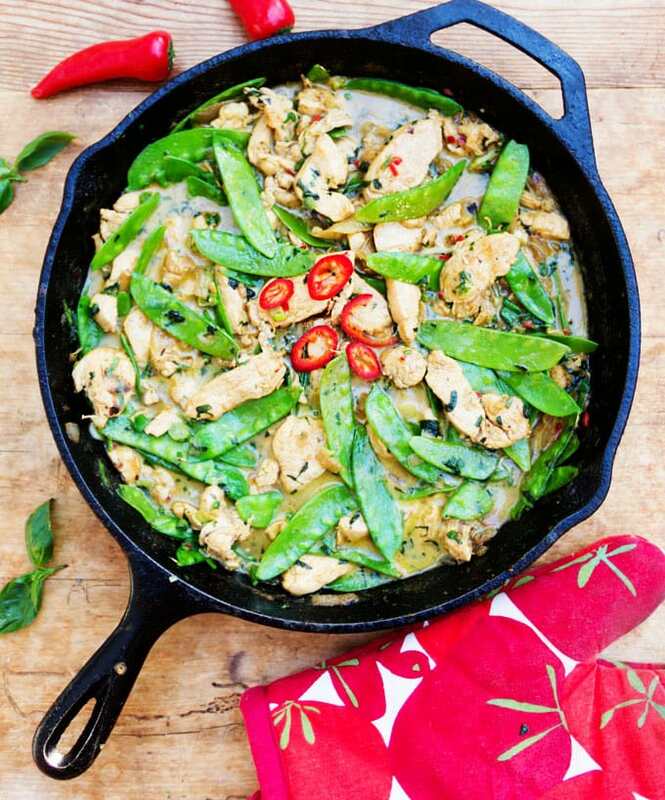 Here’s a quick and easy recipe for flavor-packed Thai Green Curry Chicken with Snow Peas. A can of coconut milk and a jar of Thai green curry paste brings authentic Thai flavors to this simple, one pan, chicken and vegetable stir-fry. After spending a week in the kitchen developing a recipe for Thai steamed fish I wasn’t quite ready to leave the land of coconut milk and curry and my thoughts turned to a longtime favorite dish: Thai green curry chicken. This dish has been a family dinner staple in our weekly rotation for years and I’ve shared the recipe with countless friends way before I had a food blog. It’s about time I share it here! It’s saucy and flavorful and brings happiness to everyone at the table and also to the cook, because it’s a cinch to throw together! Something I’ve learned over the years is that you can make a very delicious Thai green curry dish with little more than store-bought Thai green curry paste and a can of coconut milk. Adding aromatics like onions and ginger, and fresh herbs like basil and cilantro, takes the dish to even higher heights of deliciousness. For this recipe everything is cooked in one pan. I use my cast iron skillet. Sliced boneless chicken breasts are sautéed with onions, garlic and ginger and then simmered with coconut milk, basil, cilantro, ginger and a good amount of flavor-packed Thai green curry paste. 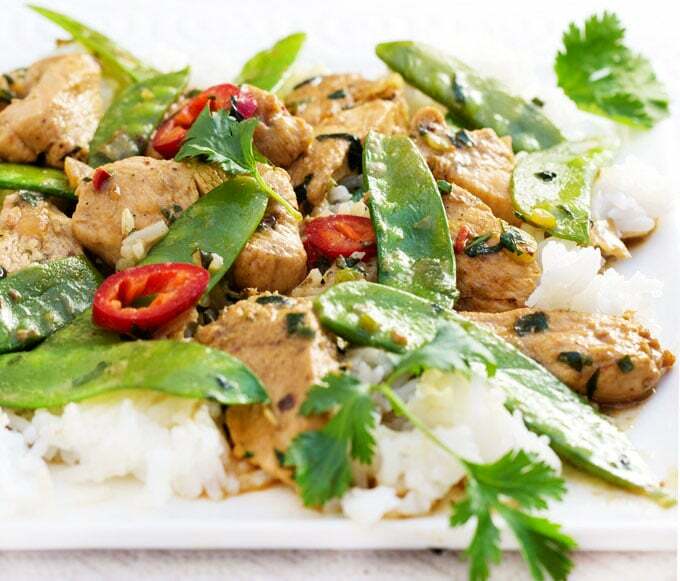 Serve Thai green curry chicken with steamed white rice on the side to soak up all the fragrant curry sauce. As I mentioned, I’ve been really pleased with using store-bought Thai curry paste for this recipe. I’ve gotten great results with Maesri Thai Green Curry Paste and with Thai Kitchen Green Curry Paste. The Maesri is spicier than the Thai Kitchen so I recommend that you add a tablespoon at a time to your sauce and test for your desired degree of heat. There’s a wonderful harmony of complex flavors in the sauce – a quality that is prized in Thai Cuisine. 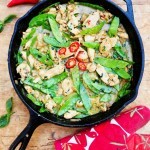 Here’s the recipe for Thai green curry chicken with snow peas. As always, I would love to hear back from you. If you try this recipe, I hope you’ll come back to leave a star rating and a comment so I know how it turned out for you. Boneless chicken and snow peas in a fragrant spicy thai curry sauce. 1–2 red chili peppers, seeds and ribs removed, finely chopped – I love using red fresno peppers. Thai red chilies or red jalapeño peppers are also great choices. *Note: See post for green curry paste recommendations. Also note that store-bought curry pastes differ dramatically in heat, so add 1 tablespoon at a time and test for your desired amount of heat. Heat oil in a large skillet or wok over medium-high heat until hot but not smoking. Stir-fry onion and ginger for two minutes or so, until fragrant. Add sliced chicken and stir fry for 3-4 minutes until it all loses its pink color. Transfer chicken and onions to a bowl and set aside. Add coconut milk, chicken broth and curry paste to the skillet. Bring to a boil. Lower to a gentle simmer and cook for 3 minutes or so, to thicken the sauce. Stir in sugar, fish sauce, basil, cilantro and chopped chili peppers. Return chicken to skillet and cook, stirring, for a minute. Add snow peas and simmer gently for 3-4 minutes longer, or until chicken is cooked through. Remove from heat. Stir in scallions. Season with a little salt, to taste. Serve with rice and garnish with chili peppers and basil, if you like. 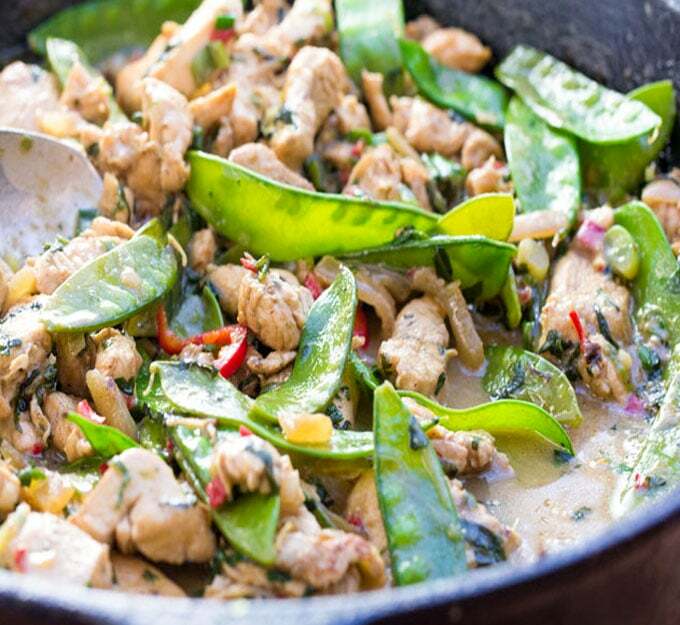 If you enjoy recipes like this, here’s another delicious version of Green Curry Chicken from Cooking Light. It’s served in bowls with bok choy and rice noodles, and it comes together in less than 30 minutes. This is the very first time I have felt compelled to leave a comment about a recipe. This was so incredibly amazing, and could not have been easier to prepare. My husband could not believe I made it. We regularly go to an Asian restaurant for this dish and now I can make it at home, for a lot less money ! Thanks for making my family so happy tonight ! Next I am going to make the white chicken chili for a party – I hope I have the same level of success! I’m so happy to hear that you and your family enjoyed the Thai Green Curry. Thank you so much for taking the time to leave a comment Jeanne! It’s so great to know when one of my recipes is appreciated. I hope you have the same experience with the chicken chili. I’d love to hear how it goes! This was a real hit. The family loved it so much I tried it with red curry paste and it was again outstanding. Hi Julius! I’m so glad you and the family enjoyed the green curry chicken. I’m curious – did you find the red curry paste to be milder than the green or about the same level of heat? Thanks so much for letting me know how it turned out!